Background: Obesity is no longer considered as a cosmetic issue as it is a potential risk factor to develop hypertension, type-2 diabetes, Cardio Vascular Diseases (CVDs), infertility, arthritis, etc. Apart from genetic factors, changes in life styles, food and work habits have lead to an alarming increase in obesity ailments in both developed and developing countries. The excess and unutilized food taken in is converted into lipid components, primarily triglycerides and is stored in the liver, adipose and other tissues; if the positive energy balance extends for a longer period, it leads to overweight, obesity and CVDs. Cardiovascular diseases are a group of disorders of the heart and blood vessels and cause greater mortality rate worldwide. Although a number of drugs have been developed to contain these diseases, most of them suffer from significant side effects and some of them have been even withdrawn from markets. In view of this, there is a growing emphasis for natural product based drugs. 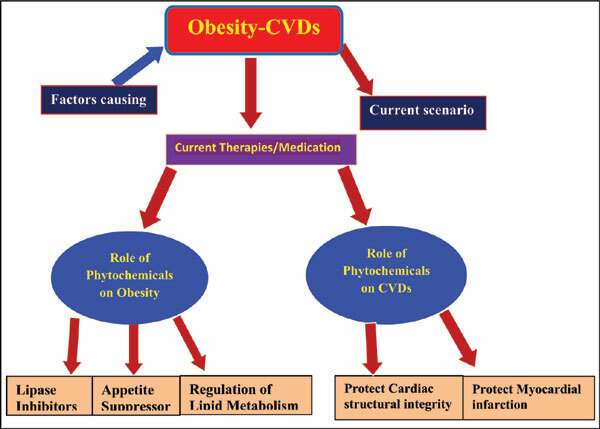 Conclusion: In this article, the present scenario of obesity-CVDs and their causative factors are described besides mentioning currently available medications to treat them. The role of phytochemicals in treating obesity-CVDs and their possible mode of action are also highlighted. This study strengthens our understanding of obesity-CVDs and paves the way to develop novel and cost-effective plant based drugs/formulations with negligible side effects to treat these lifestyle based diseases. Life style changes, over weight-obesity, adipose tissue, CVDs, triglycerides, phytochemicals.